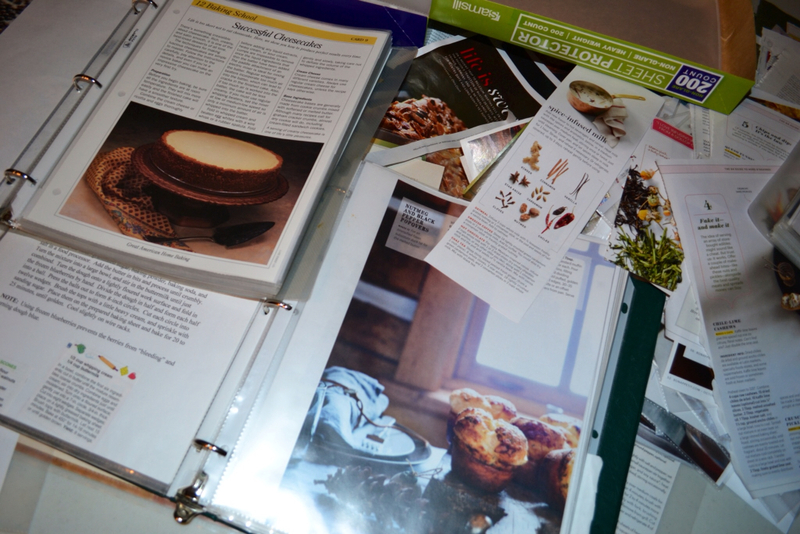 I have collected recipes since my senior year in high school. Instead of working on my art project, a mosaic made up of tiny squares of color cut from magazines, I was busy with a razor blade knife cutting out recipes! (I wonder what kids use to cut out pictures from magazines these days? Maybe rounded scissors?). That's Tyler on the couch. He's a bit miffed about not getting his much needed lap-time with Mom! The past 2 weeks, all my spare time has been spent going through my saved magazines dating back to 2007 . . . Country Living, Martha Stewart Living, Better Homes and Gardens, Bon Appetit. I decided there were so many recipes just waiting to be tried that I would never get to until I had them in one of my homemade cookbooks! 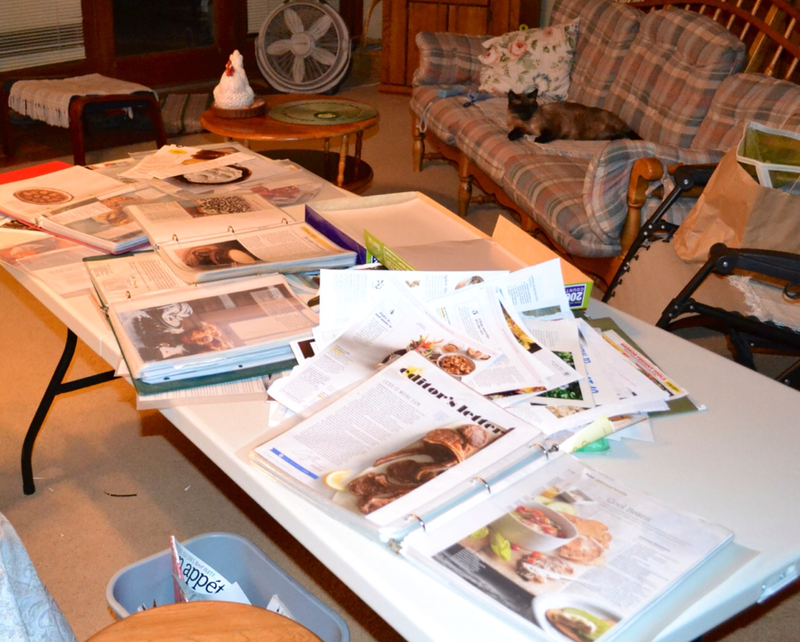 Will bought me 200 non-glare, sheet protectors and new 4 notebooks and I began the exciting and messy task of going through stacks of magazines, tearing out recipes that peeked my interest. 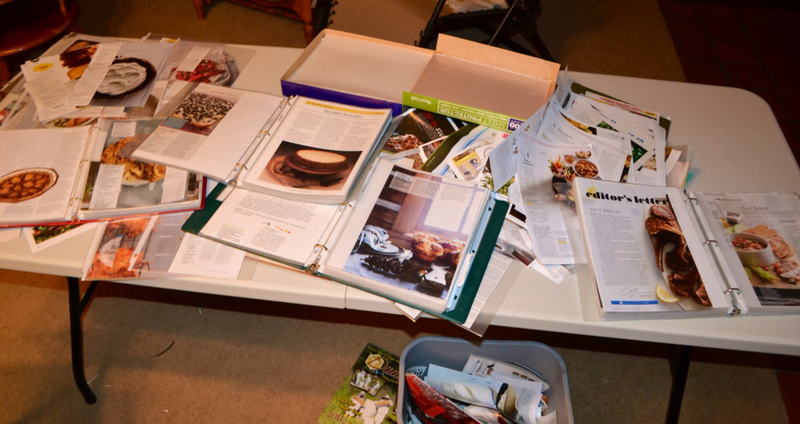 Right now I'm working on trimming the recipes and photos, taping them together, putting them in plastic sleeves, categorizing all the recipes and putting them in stacks, and some right into cookbooks! My house is in a bit of disarray! I began working on a TV tray table, added a stool, then another TV tray table and finally I'm using a 6-foot table and TV tray table! I've focused on recipes for veggies, rice, potatoes, meats, cookies, ice cream, cakes, and lots of new pie recipes! 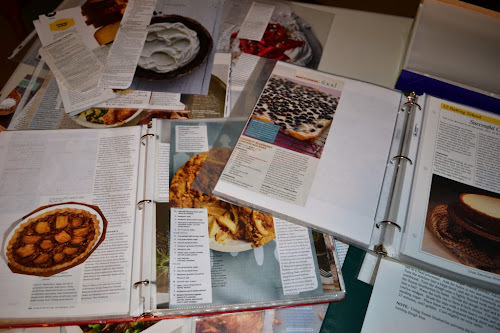 I found a press in pie crust recipe that will make pie crust a breeze, a recipe for yeast buttermilk biscuits, and a batch of recipes using homemade yogurt as the base! 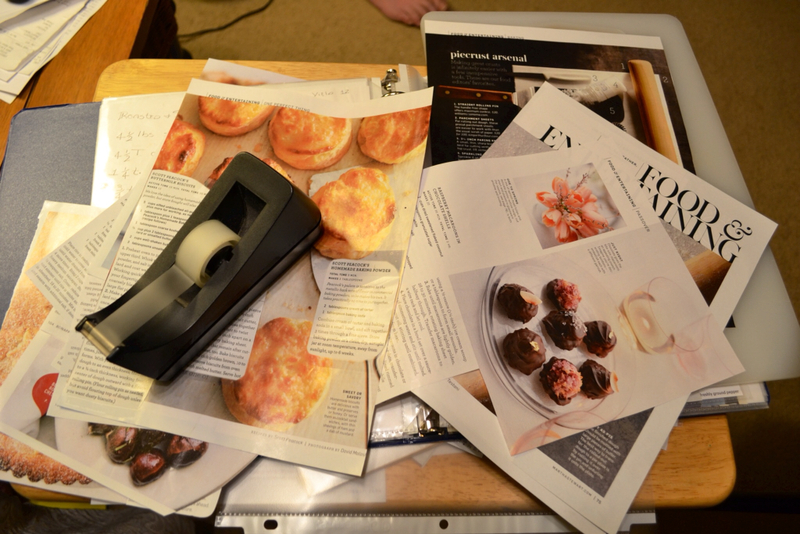 I can't wait to share these "new" recipes with you! I'm so thankful Will puts up with my project "messes"! Maybe it's because he's looking forward to tasting the fruits of my labor? I'm not certain, but sure am glad he's has a good sense of humor, is patient and loves me so much! Busy and trying to get organized . . . Over at Julie's!! !